Today is Canada Day, which marks the joining together of the colonies of New Brunswick, Canada (present day Ontario and Quebec), and Nova Scotia into a federation of four provinces on July 1, 1867. Tim and I celebrated by visiting Fort Rodd Hill Historic Park where red and white t-shirts, picnicking families, and festivities marked the day. 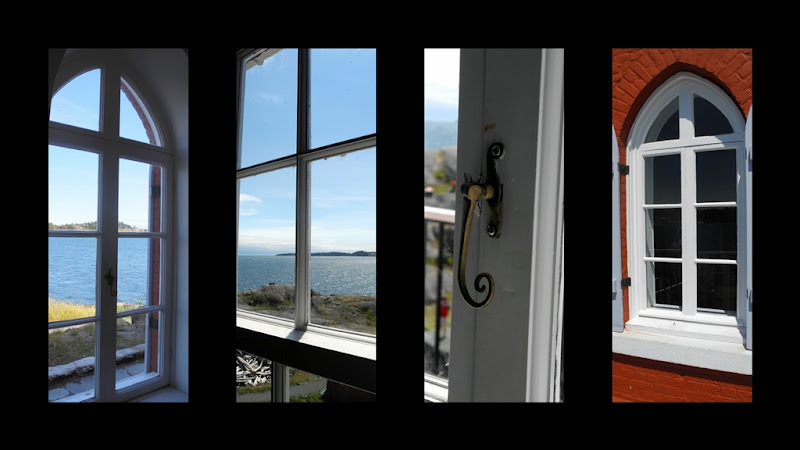 The park is also home to Fisgard Lighthouse, the oldest lighthouse on the west coast of Canada. The building is beautifully maintained, with interactive displays for visitors of all ages. 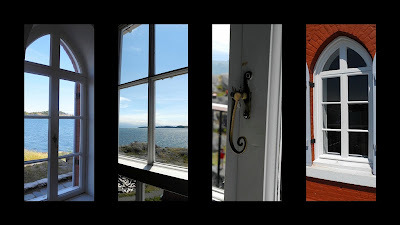 Wandering through the somewhat crowded space, I was struck most by the gorgeous vistas seen through sparkling glass held by pristine window frames. A lot of care has gone into the caretaking of this site. A rather strong wind blew the clouds away and we lifted our faces to the sun and welcomed the warmth. I hope it returns every day. Fort Rodd Hill was constructed at the end of the 19th century, in conjunction with Britain who feared war with Russia. No shots were ever fired in war, no battles ensued here. The gun emplacements, one of which is seen above, are now empty. Children climb on the embankments. Families play games, couples lounge on blankets spread on the grass. As part of the festivities, there was a shooting display. I recently re-read Remarque's All Quiet on the Western Front, and when the machine gun stat-stat-stat sounded, I thought how terrible it would have been to exist in the trenches under such a barrage of noise and fear for days on end, as the soldiers of World War I experienced. How fortunate are we who live in peace. Much of the world is not so blessed. The UK is celebrating the Queen's Jubilee Year and the Olympics. Later this month both the USA and France celebrate their Independence and Bastille Days. Let us celebrate humbly, knowing that freedom is precarious and hard-won. Your celebration of this great day looked most enjoyable. Happy Canada Day, Lorrie. It sounds as if you celebrated in find style visiting this beautiful lighthouse. Isn't it wonderful that part of its history is that no battle was ever fought there... I am able to say that of a number of fortresses built in my corner as well. Still...best to be prepared. Course, that's just a personal opinion. One day, you'll take the grands there and they will enjoy all the sights and interactive displays and they, too, will enjoy the beautiful scenery. I meant to write you earlier to wish you a very happy Canada Day!! Sounds like you've had a wonderful holiday! Thanks for sharing the celebration. Happy Canada Day! Happy Canada Day, cousin. I love Fort Rodd Hill and the lighthouse. So beautiful there. Happy Canada Day, you celebrated with lovely weather. It was a beautiful day to be near the water. We celebrated with a walk at Witty's Beach. I love touring lighthouses. Looks like a very pretty spot. Wonderful post and photos. I hope you had a very Happy Canada Day. I'm glad you are enjoying your holiday! Beautiful photos and mosaics. I love lighthouses! It was a gorgeous day, sunny and warm here. Happy Canada Day!! Hope you had a wonderful Canada Day, Lorrie! Beautiful photos to accompany your patriotic tribute post, lovely. Belated Happy Canada Day greetings from Normandy. 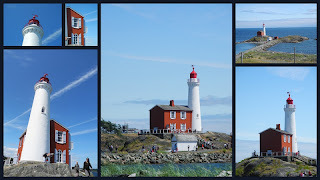 We are so blessed to live in Canada and I enjoyed the memories of seeing Fisgard Lighthouse. I haven't been for years and would enjoy seeing the displays and wandering through Fort Rodd Hill park once again. Glad to hear that you had such a nice outing on Canada Day!